Engaging your customers through communication channels such as push notifications is important for mobile app success. AWS services such as AWS Mobile Hub and Amazon Pinpoint enable you to do this in a scalable and cost effective manner. When using these services with development tooling like Ionic Framework you can rapidly develop modern applications to build your business. Ionic recently announced that they are sunsetting their Push and Auth services. We recently launched an Ionic Starter Project and posted a tutorial for adding sign-up and sign-in to an Ionic project to help customers evaluate AWS as an alternative for migration. In this post, we cover how to add push notifications to your Ionic project with Amazon Pinpoint. In this tutorial, we show how to add push notifications with Google Cloud Messaging (GCM). A similar procedure can be followed for Apple Push Notification service (APNs) which you can find on the Apple Developer website. Open a web browser and navigate to https://console.cloud.google.com/home/. Select IAM and admin on the left. Click Settings and note the Project Number. In the Search Bar at the top of the screen, type Cloud Messaging and click it. Select the Credentials section on the left. Click Create Credentials, select API key and save this for later. You should now have a Project Number and API key that you can use in the following sections. The Registration ID for the Android device to send push notifications to via GCM. An action to perform after a push notification is received. For this sample, we log the Registration ID to the console and then pop up an alert when a push notification is received. You can find more information on this process in the Ionic documentation. Save your code and run the Android application. 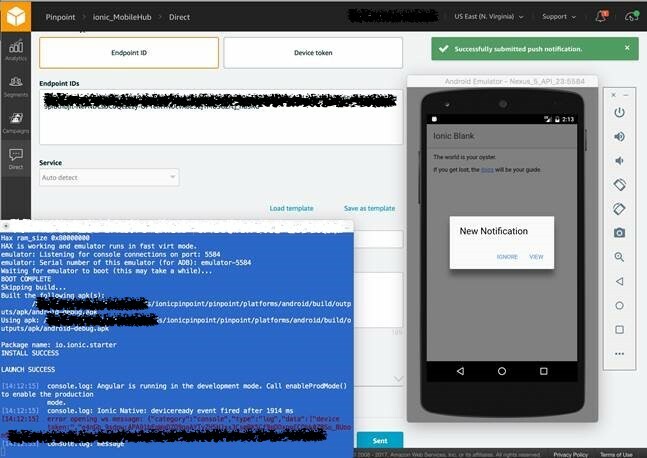 To test your application with Amazon Pinpoint, first create an AWS Mobile Hub project from the console. Create a project with a unique name. Select Messaging and Analytics, click Messaging, and then click Mobile Push. Click Android and then enter your API Key and Sender ID as appropriate (remember – Sender ID is the Project Number from the GCM console). On the left side of the Mobile Hub console, click Engage. This opens the Amazon Pinpoint console. Click Direct on the left side of the page and you see a Mobile Push tab. Keep this open. Copy this token and paste it in the Amazon Pinpoint console in the section called Endpoint IDs. Then, at the bottom of the page, type a Title and Message, and then press Sent. If successful, there is a New Notification message on the phone. Please let us know which additional features or tutorials for using AWS and Ionic technologies together you are interested in. You can leave us comments here or on the GitHub repo.